﻿﻿Inicio gira We Shall Overcome - The Seeger Sessions. ﻿El sonido definitivo. 2CD oficiales. Some things are meant to be. 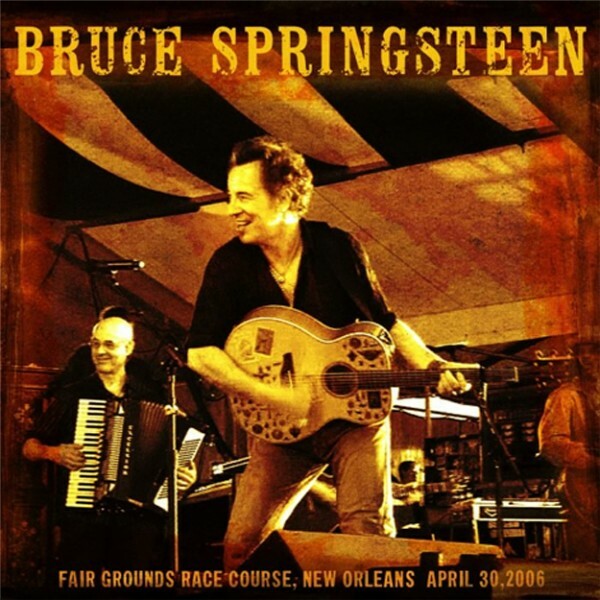 That Bruce Springsteen’s immersion into roots music, The Seeger Sessions, was released just six days before he and the band of the same name appeared at the first New Orleans Jazz & Heritage Festival post-Hurricane Katrina had to be an act of benevolent fate. Rarely has the subject matter and style of a particular set of music felt so apropos to a moment. Reverent reflections on Bruce’s Jazz Fest performance have continued ever since. “I am not alone in ranking that show as quite likely the best, and certainly most emotional, musical experience of my life,” wrote New Orleans Times-Picyune critic Keith Spera in 2012. With such heady endorsements, Jazz Fest 2006 fully merits inclusion as the latest release in the archival download series. For those not lucky enough to witness the show in person, the official recording also represents a fresh opportunity to re-experience the performance, previously only available via audience recording. The sound here, mixed from multi-tracks by Jon Altschiller, is full-bodied and warm, with a wide-stereo mix that gives space to all 20 or so players and singers on stage, and just the right amount of crowd response to capture the full bilateral experience. “Alright, this is our first gig, let’s hope it goes well,” Bruce says at the top, summing up a spirit that’s equal parts purpose and looseness. The looseness is there by design in the very act of assembling and bringing this seemingly unwieldy number of accomplished players to the stage to play timeless folk and protest music (save for a few reworkings of Bruce’s own songs) for the first time on the road, as Jazz Fest also doubled as opening night of the Seeger Sessions tour. The result is a Springsteen performance that’s fully in the moment and delightfully off the cuff. One minute he’s solemnly addressing the difficult times many in the Jazz Fest audience were experiencing, the next he’s mocking his own inability to tune a guitar or having an amusing wardrobe malfunction with his belt. Of the Seeger-ized originals played here, “Open All Night,” reimagined as a big-band rave-up, is the standout, but another of Bruce’s own compositions, written with this kind of band already in mind, provided the night’s emotional crescendo. Throughout the set, lyric after lyric from the Seeger Sessions material feels penned for the New Orleans audience. “What happened to you poor folks just ain’t fair,” Springsteen declares in “How Can a Poor Man Stand Such Times and Live?,” while “O Mary Don’t You Weep” prophesies, “Brothers and sisters don’t you cry, there’ll be good times by and by.” Hearing such words of acknowledgement and hope sung out in such a musically engaging performance translates wonderfully in the Jazz Fest 2006 recording.